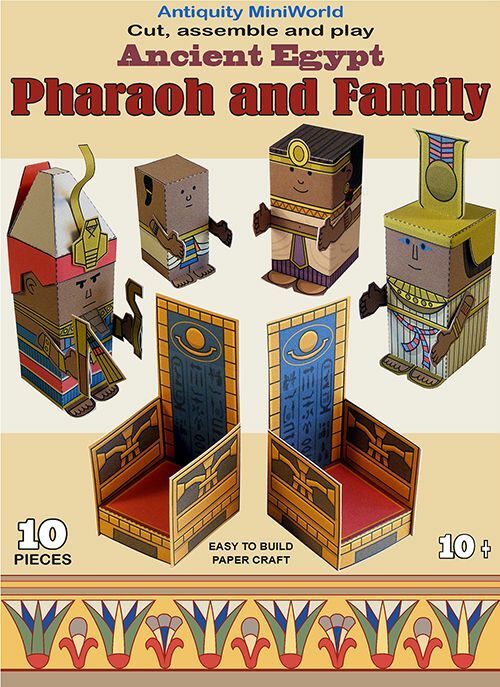 4 Egyptian figures and 2 thrones to cut out and assemble from the series Antiquity MiniWorld. Easy to build paper crafts, recommended for age 10, but once built, children younger can play with these figures. This Egyptian MiniWorld set is compatible with other MiniWorld sets (The Castle, The Dinosaur series, The Vikings, the medieval set and the Bible MiniWorld series). Once you have downloaded a set you can use different parts such as the terrain tiles or scenery to add to your other new sets; also you can print several copies of certain parts and assemble them in a variety of ways to create a larger set. Then you can use these for a diorama display, for re-telling a story, or even for the children to play with. Enjoy learning with play!